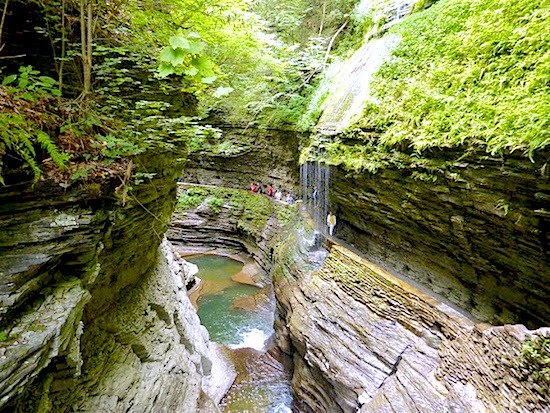 The primeval gorge at Watkins Glen State Park is a natural wonder that draws tens of thousands of visitors each year. CANANDAIGUA, NEW YORK — Less than four hours by car from Toronto, the Finger Lakes is an upstate New York destination that offers much more than water, although there are plenty of aquatic activities, from kayaking to cruises. More than 120 wineries dot the area, and there are wine trails, cheese trails, walking and hiking paths, many punctuated by waterfalls. The Finger Lakes radiates serenity, with rolling farmland, well-kept small towns and picture-perfect homes dating from the early 1800s. And everywhere there are the lakes. Aboriginal groups named them the Finger Lakes because they look like fingers on an outstretched hand. Part of any first-time experience is noting the places you want to return to. Here are some highlights of my Finger Lakes’ exploration. Canandaigua, southeast of New York state’s third-largest city, Rochester, is a destination full of pleasures. There’s the glittering lake, 26 kilometres (16 miles) long, where Humphrey Bogart used to spend his summer vacations, and where LL Bean now offers kayak lessons and tours. Canandaigua Sailboardingrents all manner of boats and will show you the basics of sailboarding. On the north shore is Main Street, with charming one-of-a-kind shops. In winter, Bristol Mountain has the largest vertical ski drop (1,200 feet/365 metres) of any winter resort between the Adirondacks and the Rocky Mountain ranges. For foodies, the standout is the New York Wine and Culinary Center. Opened in 2006 to showcase New York’s agriculture and wine, it’s a one-stop destination for tasting the many wines of the region, browsing the gift shop, and dining in the Upstairs Bistro, which overlooks the lake. The cooking classes are offered in a large state-of-the-art kitchen with multiple cooking stations. A few kilometres from the southern tip of the lake is the arts centre of Naples, an old hippie haven now known for its grapes, waterfall-dotted nature trails, charming and affordable B&Bs and eateries, galleries, spas and the small but professional Bristol Valley Theatre. Watkins Glen, of NASCAR fame, is about 82 kilometres (50 miles) from Canandaigua. Set on the southern tip of Seneca Lake, it combines breathtaking nature with a funky ambience. The place is famous for its racetrack (www.theglen.com), which attracts NASCAR’s professional daredevils. Mere mortals can drive on the same track along with other cars carrying what seems like pilgrims visiting a holy site. I have driven more treacherous turns in California. Still, people revere this place. When I came to the grandstand, the amateur drivers got out and took photos of each other. 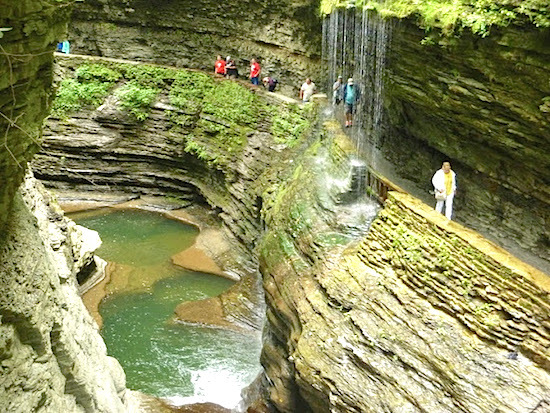 Watkins Glen State Park features 19 waterfalls and hundreds of photo-ops. What is most astounding about Watkins Glen is its state park, the most famous of all the parks in the Finger Lakes. It’s a 90-minute walk, circling gorges and waterfalls large and small, passing trees and grass sprouting from stone. Walking inside this huge primeval spiral, you come upon one marvel after another: rocks sculpted by nature, nineteen waterfalls, some straight, some twisted. In the park area, there is an Olympic-sized swimming pool. Camping is nearby. Back in town, the low-rise main street ends at Lake Seneca, at 800 feet, the deepest of the Finger Lakes. Gouged out by glaciers 12,000 years ago, it flows to the Atlantic Ocean through the Eerie Canal system.. There are cruises of various lengths, and some have lunch or dinner (contact www.senecaharbourstation.com). Summit to Stream Adventures rents kayaks for $18 for the first hour. An hour’s drive southeast is Aurora, an historic town on the central shore of Cayuga Lake. At 66 kilometres (41 miles), it’s longest of the 11 Finger Lakes, and at 435 feet, the deepest. My first stop was the Heart and Hands Winery. Sitting on a promontory above the lake is a boutique winery that’s high in elevation and quality. On the road is a sign warning “No buses or RVs.” This is to discourage the heavy drinkers and tours, explains owner Tom Higgins, who decided to follow his bliss after a career in high tech. 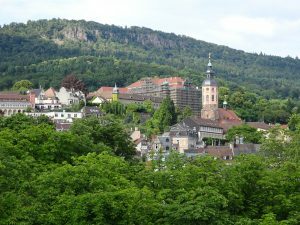 Using the region’s terroir, he specializes in reisling, the area’s signature wine. The winery also makes several pinot noir wines. A short distance away is the Aurora Inn, built in 1833 in Federal style, with stately porches and shuttered windows. It dates from a time when lake transport and industrialization brought riches to the region. Today, historic charm blends with up-to-date luxury in the 10 guest rooms, many with working fireplaces. Rooms start at $175 and go to $350, depending on the season. The inn is open all year; in the winter there is skiing and snowshoeing in the area, and winery visits lead into evenings around the fire. In summer, you can sit outside the Aurora Inn Restaurant, which faces the lake. Seafood chowder ($7) is the best I have ever had: chunks of haddock and scallops in a cream broth with celery , and if there were potatoes I didn’t see them. Now I get it, chowder is supposed to be about the fish, not about cornstarch and potatoes. What I’d have if I returned: wine dinners, which are scheduled through the remainder of 2015. On a return trip to Aurora I’d visit the Mackenzie-Child’s outpost, the home décor outlet selling discontinued or slightly damaged products. Many of the ceramics are crafted in Aurora. You can also visit their farm, which has a Victorian farmhouse and gardens. I’d also take a Water to Wine Tour, departing daily from Aurora and nearby Interlaken. One of the tours stops at the Aurora Inn for dinner. Next door to the Aurora Inn is the Bet the Farm Store, which sells wines and cheese and other products from the region. Try tasting the wine and cheese flight ($10), and sample luscious cheeses from such local fromageries as Lively Run Goat Dairy and Keeley’s Cheese. Ed Easter, who used to work for MAC Cosmetics in Toronto, does the talking and serving in a way that is funny and informative. He tells me that Cabernet Franc is the main red of the Finger Lakes. Drive about a half-hour from Aurora and you’ll land in Ithaca, on the southern tip of Cayuga Lake. It calls itself Gorg-es, after its many gorges and waterfalls. Indeed, Ithaca Falls has become the symbol of the place. The towering waterfall is more than 100 feet and stretches 175 feet across its base. And yet it’s accessible — you see people clambering over its banks or sitting just below it in meditative states. Nearby is Taughannock Falls State Park, where you can rent a kayak or go on a one-hour cruise. Or just sit on the dock and watch the boats go by. Ithaca, of course, is known for Cornell, the Ivy League university, whose alumni include Bill Maher, Toni Morrison and Ken Dryden. The student population animates the place, which boasts a lively downtown, with l9th-century buildings housing boutiques and cafes. Turn the corner and you’re on restaurant row, full of serious and crowded eateries, without a chain to be seen. There are wineries and there is Ports of New York, an artisanal winery in old wooden structure housing barrels, a small museum of wine-making implements and an educative centre run by the spirited Frederic Bouche. He is a French transplant who comes from two generations of wine makers. He makes fortified wines and visitors are invited to try his creations. And finally, a word about Rochester, my last stop before the drive back to Toronto. It’s technically in the Finger Lakes’ area, but instead of being on a lake it flanks the Erie Canal. What a difference between what I imagined — a boarded-up main street, a city in decline — and what I saw. 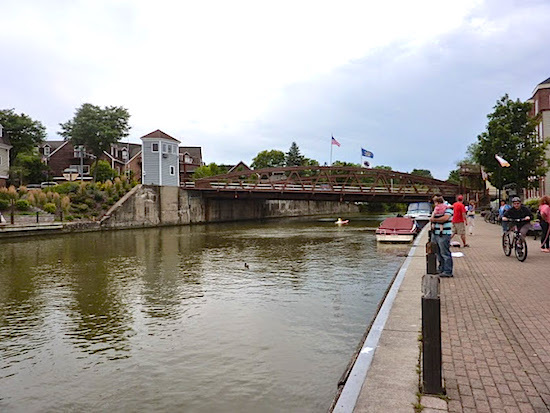 Strolling along the historic Erie Canal provides a pleasant, picturesque retreat as well as education about this important water system. First the Rochester Public Market features blocks and blocks of stalls selling fresh and prepared foods. One local favourite is Scotts II, famous for their ham, cheese and egg breakfast sandwich, dripping and delicious, with hot sauce on rolls from a local bakery. Nearby was classical music from string quartets, thanks to the students from the Eastman School of Music at the University of Rochester. The city is graced with neighbourhoods of mansions from the era when it was the wealthy home of George Eastman, the inventor of the Kodak camera. Eastman’s home and gardens are open to visitors, and are adjacent to the International Museum of Photography and Film, which has world-class exhibits and interactive displays. Lunch was at Wegmans, the supermarket with a succulent buffet of food to take out or eat in the store. Another place to add to my long list of places to return to on the Finger Lakes trail. Next PostHAMBURG: Germany’s Scandinavian City (Appeared in Ensemble Vacations).